Around this time last year, we launched the first version of Moodnotes in partnership with Thriveport. We're proud to say that today a new and improved version is out for iOS. Making useful and sustainable products that bring about positive change to people’s everyday lives. The conceptual boundary between ‘health’ and ‘digital health’ is dissolving as we increasingly look for and welcome the insights that digital tools can provide. This opens up huge opportunities, but also implies serious new responsibilities for designers and healthcare professionals. The need for user-centred design in healthcare provision has never been greater. Digital design and product studios have been at the forefront of a user experience revolution in digital service design, but there is still huge opportunity in the health sector. The user insight and working practices of digital designers can be the missing piece of the puzzle as healthcare professionals, patients and new, disruptive companies aim to understand and build the future of health. There’s an ethical and efficacy component that the industry still needs to address. Touted as a multi-billion dollar opportunity – every design studio, start-up, and corporation working in m-health needs to be working harder to prove the long-term positive patient outcomes, and ultimately the savings for our stretched health services. We believe convening true partnerships with experts is the only way to tackle the user experience issues in healthcare. Delivering person-centred care depends upon collaborative, multidisciplinary efforts across institutions, businesses and designers. That’s why we're proud to be in partnership with Thriveport in co-creating Moodnotes. 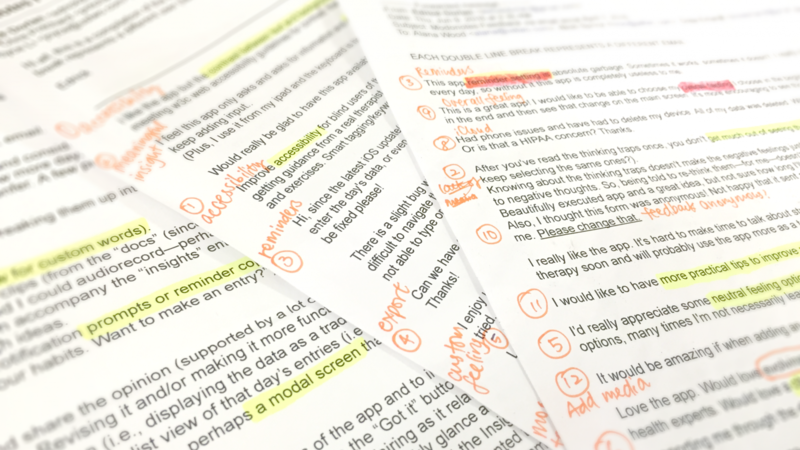 User reviews and feedback were our inspiration and guide to updating Moodnotes. Here are some of them. "I am suffering from clinical depression and anxiety. I use your app every day and I wanted to let you know how helpful it is and what a difference it's making in my life. I'm trying really hard to get better and you're helping me with that, thank you." "Thank you for supporting me through the dark. ""I love this app, I've used it once and it has already done everything I need. I feel 100% better after emptying my thoughts out, and reading some helpful hints." This is the story of how we read, listened and put our user-centred methodology into practice. 20 days. 3 people. 1 team. We kicked off our update project with a backlog planning workshop. We went through user feedback and reviews from App Store, together with some new feature ideas we wanted to explore. With limited time to work on a Moodnotes release, we arranged them according to effort and expected impact – this way, we began to shape our backlog. We were keen to both show care and sensitivity to our existing users, and to deliver new features to attract new users. We prioritised those features that had high impact to users for only moderate effort from a design and development perspective. But what about the not-so-low-hanging fruit? During the workshop, we made a hard decision to de-prioritise ‘Moodtrend’ – a plotted graph that displays your mood over time. This was one of the most requested features from users, but it was a challenging task to design for a visual representation that fits both users’ needs and clinicians’ requirement. As time was short, it was vital to focus wisely. We agreed to tackle it another time. How much impact will this make to users? Are we happy to ship the product without this? For the same amount of time invested, is there anything we can do that will bring more value? Working under a tight timeframe might not be the perfect scenario in many ways, but it definitely helped us to stay focused on tasks that deliver the most value to users. Working in a small team, things happened very organically. When we picked up a feature to start working on, I headed off to do research into existing patterns and to analyse competitors. Chris began exploring code libraries. We gathered again for a sketching session for that feature, estimating the user story along the way. Together, our mantra was – start big > go wild > consolidate > get small & focused. Before these sketching sessions, we'd discussed pain points from user feedback, and during the session, we surfaced different scenarios and enriched features. Time for product owner hats again. As we focused down, it was difficult to see exciting ideas get parked in the backlog, but we were determined to be real – delivering features and maintaining the quality of the product. We are interested to see how the different aspects of your life correlate with your mood. The newly enriched ‘Insight Dashboard’ is just the beginning of the journey. With all the wearables now available, well-being tracking has never been easier. 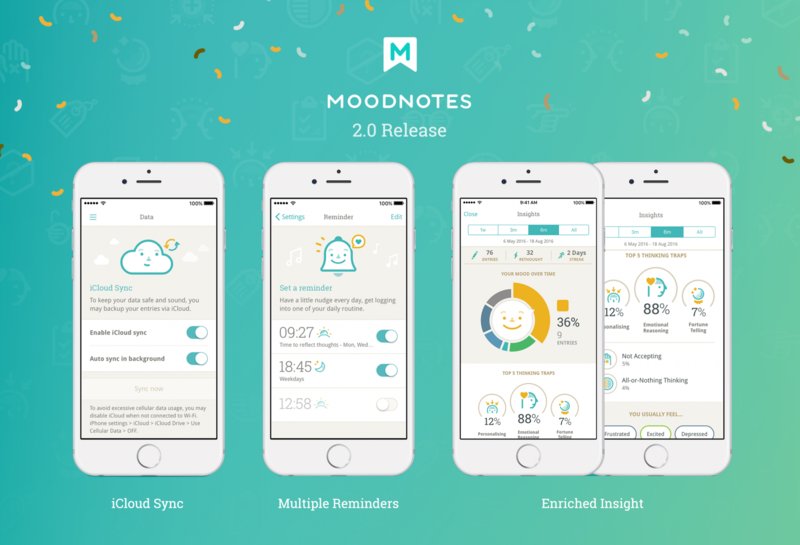 Can Moodnotes be the smart hub that integrates data from your calendar, various apps and devices, and dives into your mental well-being pattern over time? Was it the sunny morning jog, the health lunch, the afternoon with friends, or just the comfy TV dinner that made your day? We are determined to create a product that allows users to gain insights into where their mood and feelings are coming from, to increase self-awareness that hopefully leads to a healthier life. While we plan our next steps towards that ultimate goal, there is still huge scope for us to enrich the experience in the near future. Thank you to our passionate users, we received a lot the constructive feedback with amazing ideas that we would like to validate in future releases. Watch this space! Finally, I'd like to say a big thank you to the London studio for all their support, to Drew and Edrick at Thriveport and last but not least my team members Chris, Bednarz and Jarod. If you'd like to talk to us about Moodnotes, contact me on Joyce@ustwo.com.